﻿ Peak House Garden Pension, Palawan | FROM $24 - SAVE ON AGODA! "The owners were super friendly and helpful when it came to o..."
Have a question for Peak House Garden Pension? "This guest house is in a very good location in El Nido, close to the beach and most of the restaurants and shops." 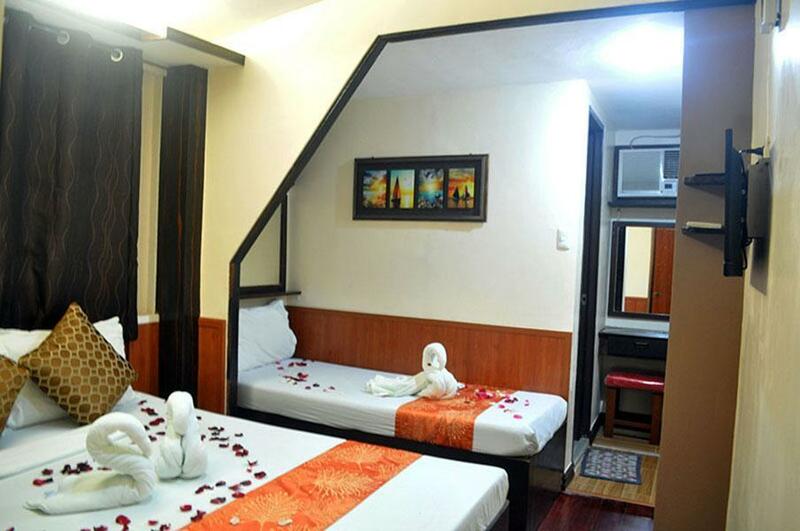 "Near to beach and bar and other restos which you can have your lunch and dinner." "Breakfast is outside in a small garden, which is nice." "The staff was really friendly." Peak House Garden Pension is a family-owned accommodation located right in El Nido's town center, just a few minutes' walk from the beach. Guests have quick and easy access to downtown and are less than a five-minute walk from some of the best restaurants, bars, bakeshops, pizza houses, and main shopping area. 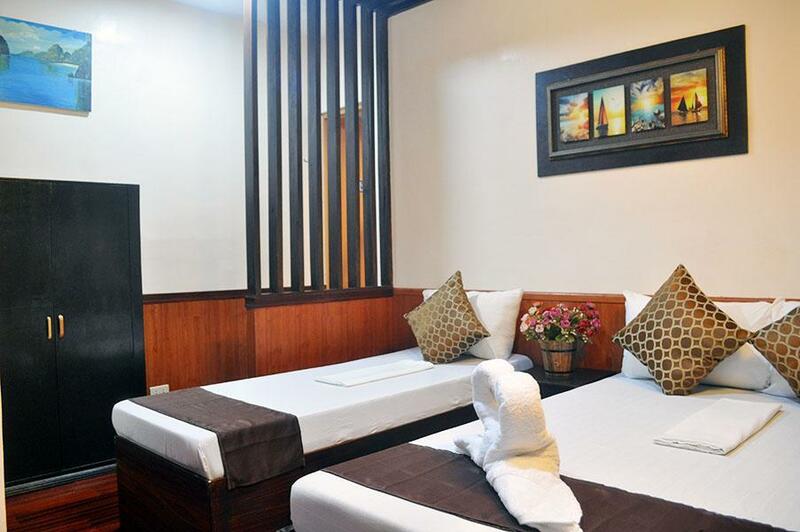 All guestrooms are fully equipped with a private bathroom, filtered water system, air conditioning, electric fan, cable TV, cabinet, and mini work desk. Wireless Internet is also available in the lobby area. Rooms have been made to ensure every comfort is met and every guest can have a most relaxing stay on this island paradise. Come and experience the comfort of tastefully designed accommodation with a touch of modern and native architecture, spacious terraces with wooden chairs and coffee table, native gazebos, and landscaped gardens that will give you a very relaxing atmosphere. "5-minute walk to the beach shore spacious family room clean..."
The location was really good, close to restaurants and tours. The staff very attentive and efficient. Our room was small and once we opened our two suitcases it was difficult to move around. It would not have matter if the weather was nice but we had to be indoors for two day s because of the rain and the lack of space was an issue. Very good place to stay! Amazing breakfast and staff! We forgot some things but they kept it for more than a week and gave back! Island tours are great value For beach lounging can’t beat taking tricycle to Las Cabanas beach - lots of chairs to use plus kayak and boards to rent! Stop at OutPost for the sunset. Great coffee at Gusto Gelato. Booking Hub very helpful staff. Although the location of this hotel is central, there are plenty of other options in the vicinity. The room was decent and clean, but the facilities were disappointing. There was only one top sheet for 2 beds, so one used a sarong. There was no toilet paper provided and the water in the sink ran brown. The staff did their job functionally, with no frills and although there are no ‘horror stories’ we stayed in 3 different places in El Nido and this was by far the least nice. OK at a push, but set your expectations quite low. The place was a perfect location near a night out/bars and the beach was just across. Staff were extremely kind and friendly! I would definitely go back. And oh, did I mention that their free breakfast is to die for??? YUP!!!! Staff are very helpful, they have contact for tricycle driver that could get you around the beaches las cabanas and nacpan. its in town so its near the package tours and the restaurants. its safe as the police outpost is on the same street. thanks for having us. This place has a great location for getting tours. Also if you want to experience the little town. The gym is a plus and the he breakfast was just enough. Staff is friendly. Con is the WiFi isnt good but that seems to be a area issue. Our fan didnt work and the ac was okay. Had a tv which we like to veg a little but they turn off everything during the day so you should be doing a day. Didnt like the bathroom but was private. Outdated and uncomfortable. Location is great, staff is indifferent and the room amenities are half broken. Pros: close to restaurants and tour pick up points. Clean room with hot and cold shower. Friendly staff. They have a siomai stall and the pork ones are very tasty! Cons: You can't expect a lot for breakfast choices since this is not a hotel. Small breakfast servings. Better to open the siomai stand earlier so guests can buy as add ons to the breakfast. Bed are not so comfy, thin mattresses causing slight back ache. Overall, i will recommend this property to my friends who are on a budget and wants to be close to the restos areas. great location near the beach and everything but not in the noisy part of el nido. nice staffs and owner, they're all very accommodating and friendly. 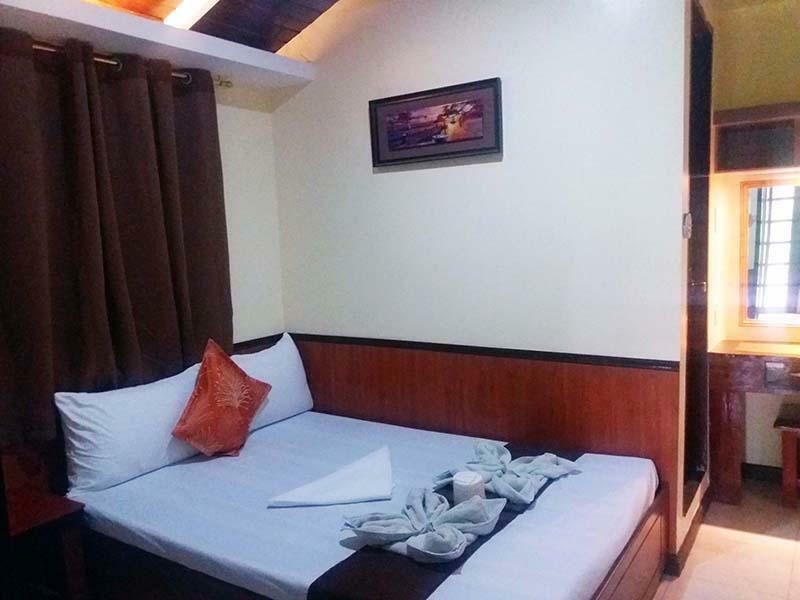 good value for money as the accommodation already includes bfast plus free use of gym (the only gym in el nido. the only cons is that the place have ants.. but over all im satisfied and will definitely stay there again. We stayed there for 3 nights and I'd say that for a very small town like El Nido, the accommodations they provided were pretty decent. I loved the fact that the owners live in the same roof, since it seemed like a house that converted some of its rooms for guests. The staff/residents were warm and friendly. El Nido is pretty noisy in general, and this pension is just few steps away from the noise. Very clean, I saw how stuff behaves in common areas - they do care about their environment. Breakfast is outside in a small garden, which is nice. Also stuff was very friendly and helped us with all arrangements. In general - value for price. Thank you for the nice stay! All other others what you can think of is not good. The staff was really friendly. It’s a quite place near the center. Unfortunately the WiFi was really slow. Very nice place, good breakfast, personal is very helpful. The hotel, staff, room, breakfast and location is good. Cant complain about anything here. Value for money. Pros: Staff, Clean, flushing toilet, hot shower, good TV, great location, small shop at gate selling siopan and water Cons: internet was only in reception and was very slow. Cons, needs to work on their shower.